This is the object that fired my interest in meteorites this year. Back in April, I gave a talk about meteorite impacts and mass extinctions at the Alf Museum. I took my little meteorite collection to have some hand specimens to show around afterward. The whole experience got me excited about meteorites, and I started doing some research online. I don’t remember exactly what investigative chain led me to the Middlesborough meteorite, whether I found the cast on eBay first, or the Wikipedia article about it. Probably the eBay hit first, because it would never have occurred to me to search for it on eBay had I found the Wikipedia article first. 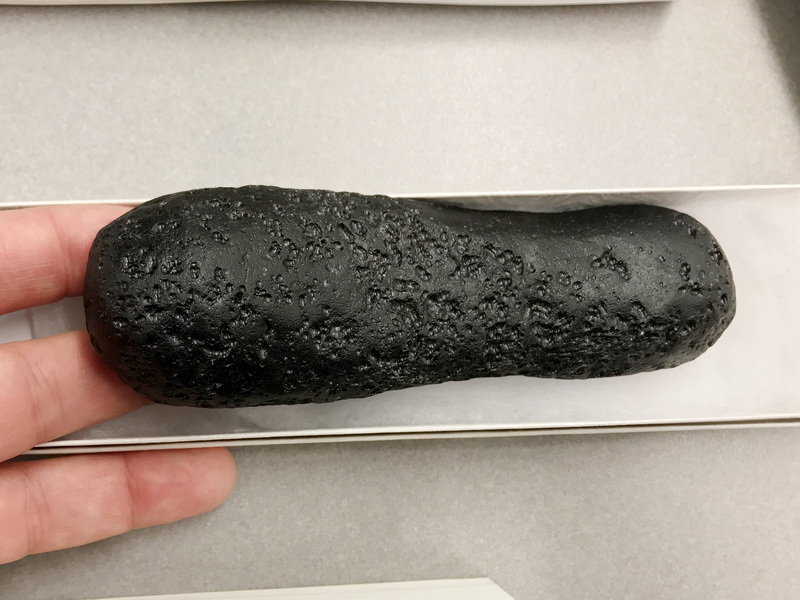 Molding and casting of important specimens may be extremely common in my day job of paleontology (even just for fun), but it is not common at all for meteorites. Off the top of my head, I can only think of a handful of meteorite casts I’ve seen: the Middlesborough meteorite; the Stromboli stone, another oriented meteorite; and the flanged, button-shaped Australite tektites. 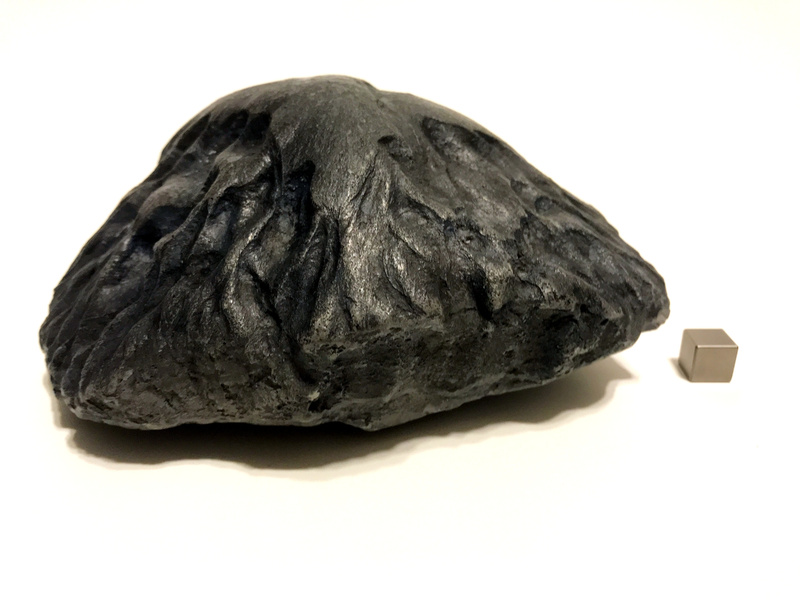 A scale model of the gigantic Willamette meteorite, made available by Nakhla Dog Meteorites, also deserves mention here. I’m sure there must be more out there, but probably not a great many more. In any case, the Middlesborough meteorite was my first encounter with the phenomenon of oriented meteorites: meteorites that maintained the same orientation as they were melted by their passage through the atmosphere, and came to be shaped like the nose cones or heat shields of spacecraft. 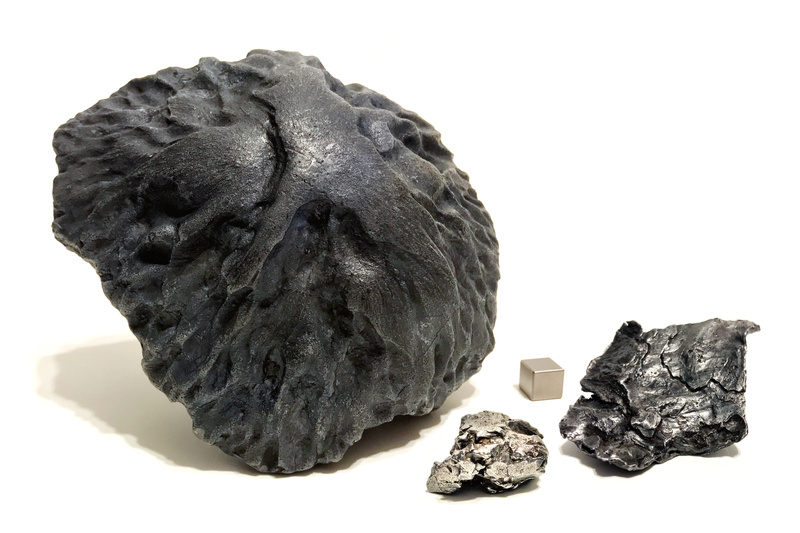 Examples range from tiny, button-shaped meteorites 1cm in diameter to large meteorites weighing hundreds of pounds. Most of the best-known oriented meteorites were observed falls that happened during daytime and often in the summer months. I think there’s a very good reason for that: possibly because of their aerodynamic shapes, most oriented meteorites come cooking in at a several hundred miles per hour and bury themselves in the ground at depths from a few inches to a few feet. I assume that oriented meteorites fall just as often in darkness as in daylight, and in winter as in summer, but since most of them bury themselves, the ones that are seen impacting have a much better chance of being discovered, and there are more people out and about to see them in the warm months of the year. Especially in farm country (which statistically has a better chance of collecting meteorites than urban areas because there’s so much more of it), you don’t tend to go around sticking your arm down newly-observed holes in the ground on the off chance that there might be meteorites down there. I didn’t know all this when I found the cast on eBay, of course. I did some comparing around, decided that the asking price was reasonable, made the purchase, and then set about educating myself about this new (to me) class of objects. Whenever I wrap my head around a new domain of knowledge these days, I like to crystallize what I’ve learned by putting together a slideshow on the topic. These slideshows serve two purposes: they help me remember what I once knew, the next time I circle back to that topic, and they help me introduce others to the subject. 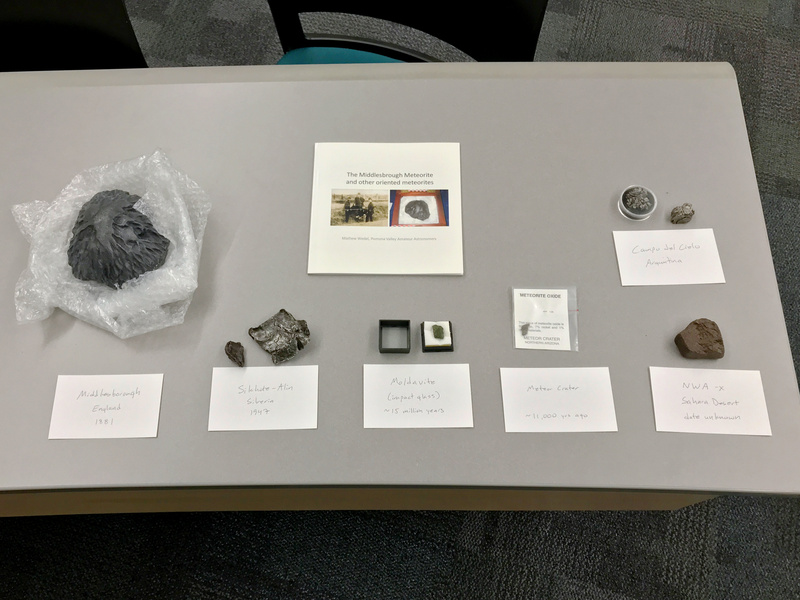 I spent a week of evenings reading up on oriented meteorites, made a little slideshow, which I presented at the next PVAA meeting, and then turned the slideshow into a photo book through Shutterfly. You can see the book amidst my expanding meteorite collection in the last post. I will probably write more about oriented meteorites in the future. For now it is very satisfying to have a cast of the Middlesborough meteorite. I see that I’ve managed to write a whole post and hardly say anything about the history of the meteorite itself, its discovery, and subsequent studies. I’ll try to get to those things in the not-too-distant future. Last night was the September general meeting of the Pomona Valley Amateur Astronomers. Instead of having an outside speaker, we had meteorite show-and-tell. 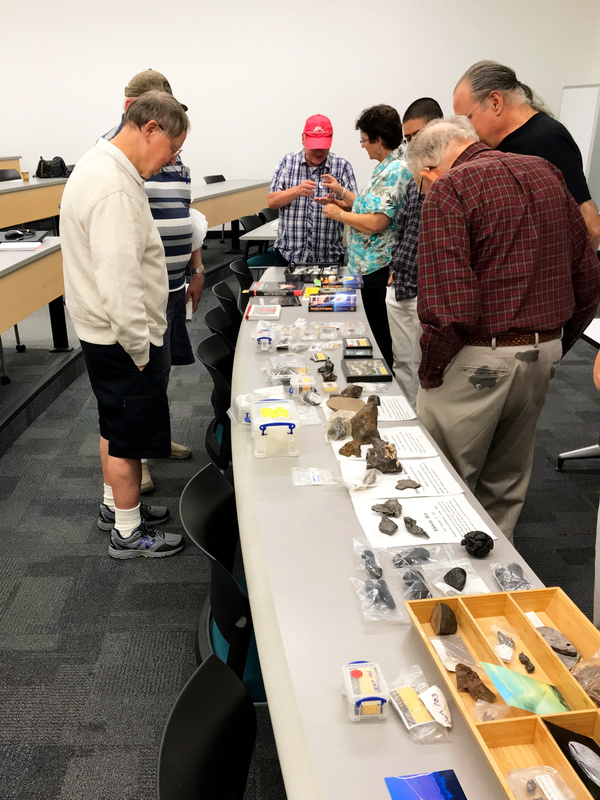 Members brought their personal collections of meteorites and impactites, or talked about their history with meteor-hunting, or both. We kicked off with a short talk by Dr. Eldred Tubbs, who told us about his experiences working with the Prairie Meteorite Network when he was on sabbatical from Harvey Mudd in 1969-1970. The Prairie Meteorite Network was a program run by the Smithsonian Astrophysical Observatory between 1964 and 1975, which used a series of wide-format cameras scattered across the Midwest and Great Plains to capture images of bright meteors, in hopes of locating the resulting meteorites. In ten years of operation, the Prairie Meteorite Network only discovered one meteorite fall, the Lost City meteorite from just outside of Lost City in eastern Oklahoma. We then proceeded more or less by size of collection. 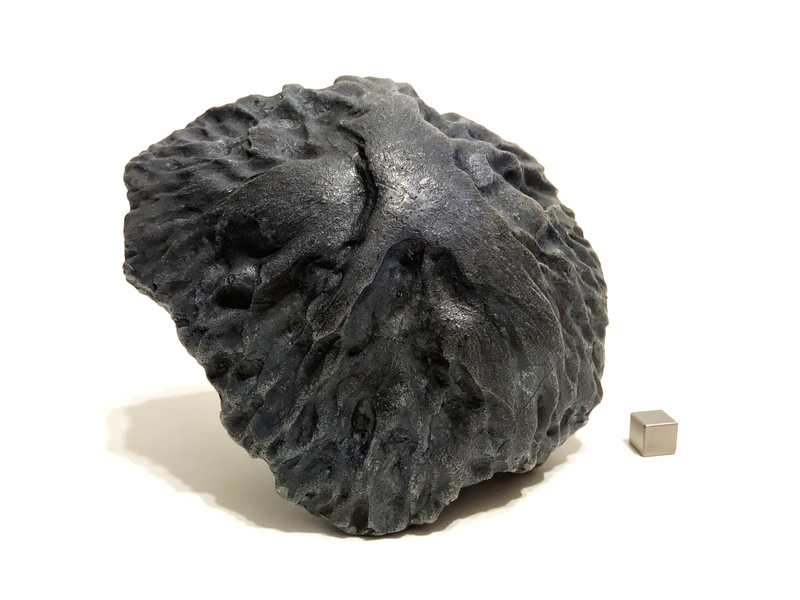 Our club secretary, Ken Elchert, only has one meteorite-related specimen, but it’s a doozy: a massive bilobed indochinite tektite the size of a small pastry. This blob of glass solidified in the atmosphere from molten material blasted out of a huge impact in southeast Asia about 700,000 years ago. 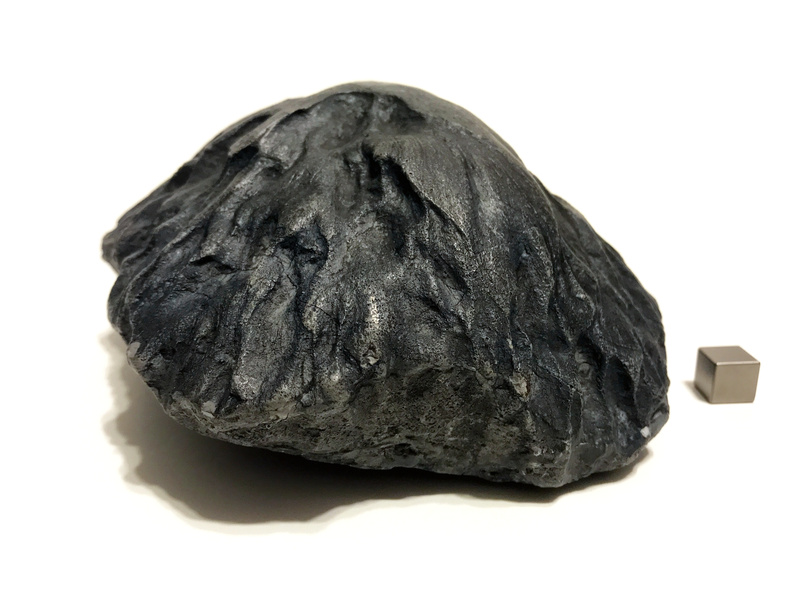 I love tektites–externally they resemble black rock, like basalt, but in fact they are glass, so they only weigh about half as much as you might expect when you pick them up. Ken’s specimen, obtained from a gem and mineral show a few years ago, was easily the biggest tektite I’d ever gotten to see firsthand or touch. Gary Thompson, our club treasurer, was up next. He presented two small meteorite specimens in nice cases. You can see them on the right side of the photo above, surrounded by books. I wasn’t taking careful notes so I don’t remember the details on the second, but the first, in the larger, wooden box, is a piece of an observed fall from 1918 in Russia. Laura Jaoui was up next. 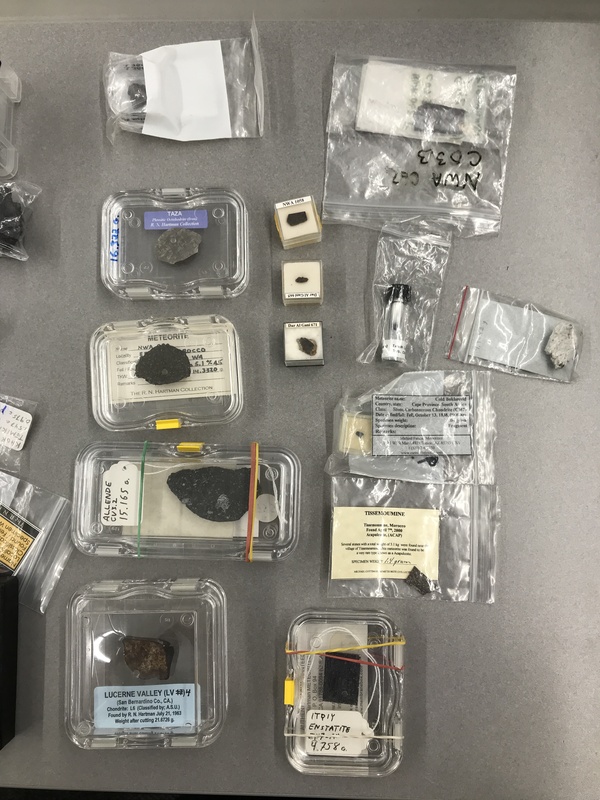 She has an extensive collection of small specimens, including fragments of lunar and Martian meteorites and a couple of small pieces of the Chelyabinsk meteor that exploded over Russia in 2013. Laura also had a lot of cut and etched pieces to show the internal structure of meteorites, especially the beautiful Widmanstätten patterns inside iron meteorites. 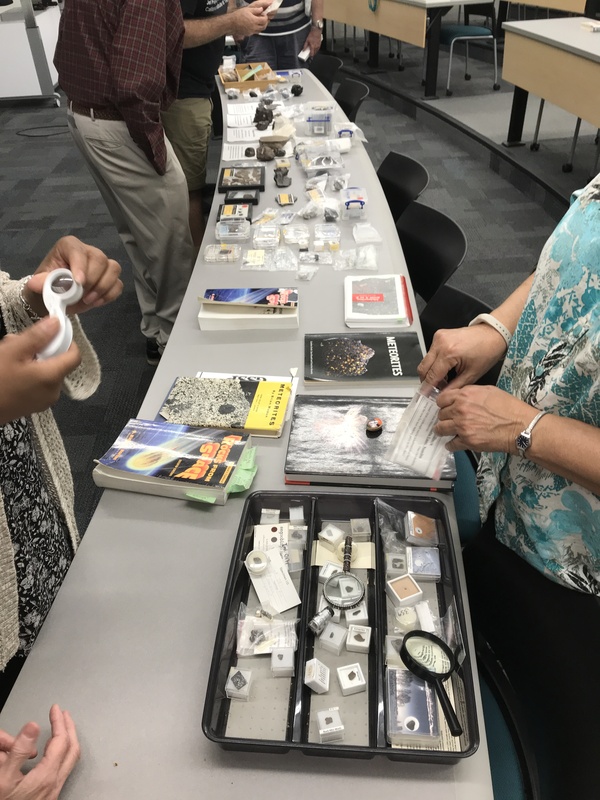 She had thoughtfully included a variety of magnifying glasses, jewelers’ loupes, and magnets for investigating the structure and properties of the samples in her collection. I was next up, with my little collection. I haven’t blogged about all of them yet. The Middlesborough meteorite is not the original–that’s on display at the Yorkshire Museum. 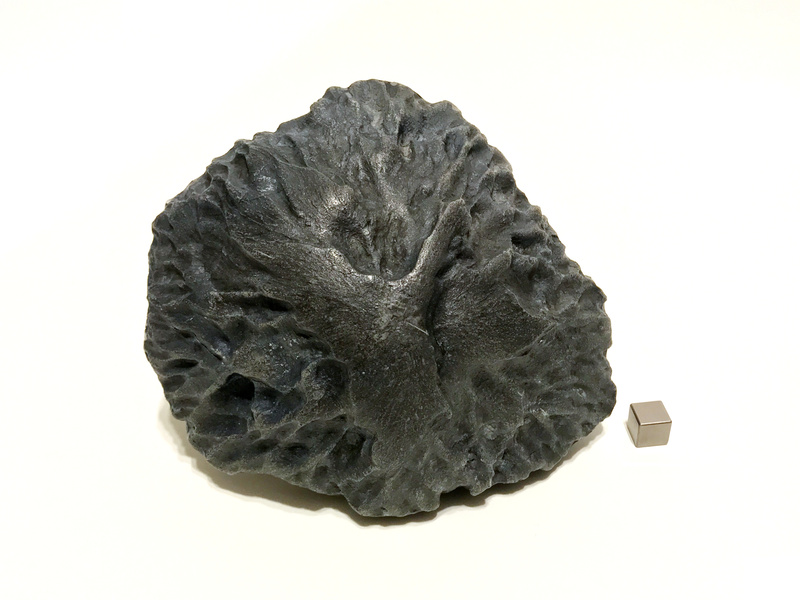 My copy is a cast that I obtained this spring, which fired my interest in oriented meteorites. I hadn’t known that such things existed, and I spent a few evenings educating myself about them. I put the results of my research into a slideshow, which I gave for the club late this spring, and later turned into the photo book shown here with my meteorites. In the time since I blogged here about my pieces of Campo del Cielo and Sikhote-Alin I’ve obtained additional, smaller representatives of both falls. The NWA Saharan chondrite I got on eBay earlier this year, and the tiny fleck of Canyon Diablo is from the gift shop at Meteor Crater. I picked up the moldavite in the center at a rock shop in Arizona last year. I do intend to blog about all of these things in time. The anchor of the evening and the star of the show was Jeff Schroeder’s collection. 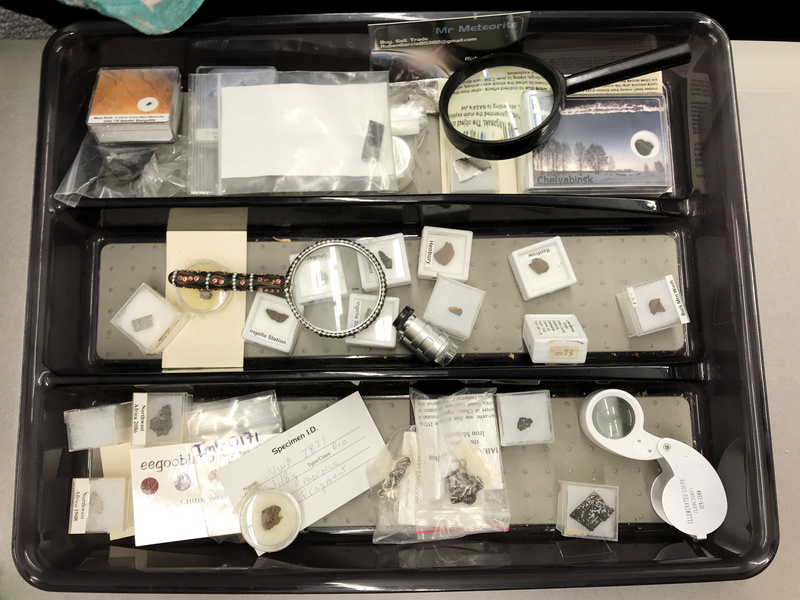 Jeff has been finding, collecting, classifying, and working with meteorites since the 1970s, and he’s worked with some of the pioneering SoCal meteorite hunters. Almost everything on the long table in the above photos is his, and that’s only a fraction of his collection. 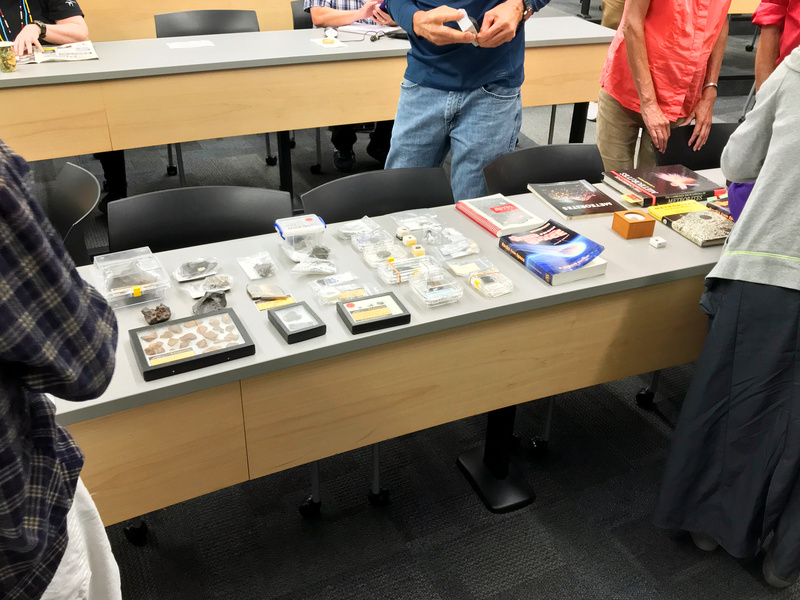 Jeff gave us a wonderful talk on the history of the collection–much of which is bound for local universities in time–and on the histories of the specimens themselves, and what they tell us about the history of the solar system. All in all, it was a great evening, with lots of great specimens and inspiring conversations. We should do more things like it in the future. The 50th anniversaries of the Apollo missions are coming up, and we’re planning to have members give short talks about each manned Apollo mission in the month of its 50th anniversary. But we should have a night next year just for people to bring their memorabilia of the space program. We have a lot of retired aerospace engineers in the club, including people who worked on the Apollo missions and the Space Shuttle. It would be great to hear about these things firsthand. You are currently browsing the archives for the Middlesbrough category.